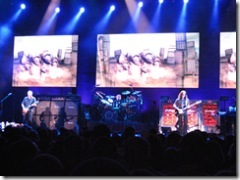 For Rush's second and final show in the Northwest, my brother Erik, friend Ken, and my son Cameron traveled south to Ridgefield, Washington, to the Clark County Amphitheater. 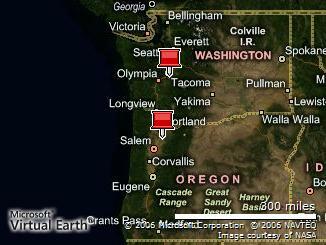 Ridgefield is 15 miles north of Portland, Oregon, and a 2-1/2 hour drive from Seattle. I was still tired from the concert the night before near Seattle and from the lack of sleep. But whenever Rush is playing within driving distance of my home, I make a point to go. 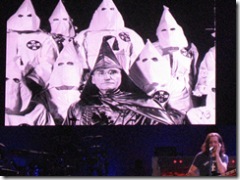 I like the different audiences, different seats, and changes in the band's performance. 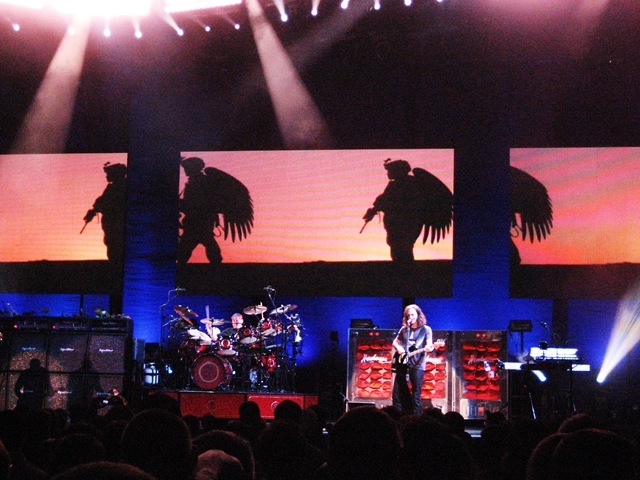 For this tour, I knew that Rush was playing an alternate set list, changing out one song for another like they did during the Vapor Trails tour, so that was an added bonus. We'd been driving for about an hour when we pulled over for lunch. 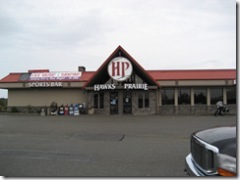 Erik suggested Hawks Prairie in Lacey, which was a favorite of my grandparents (and he figured he could get in a little gambling at the casino next door). 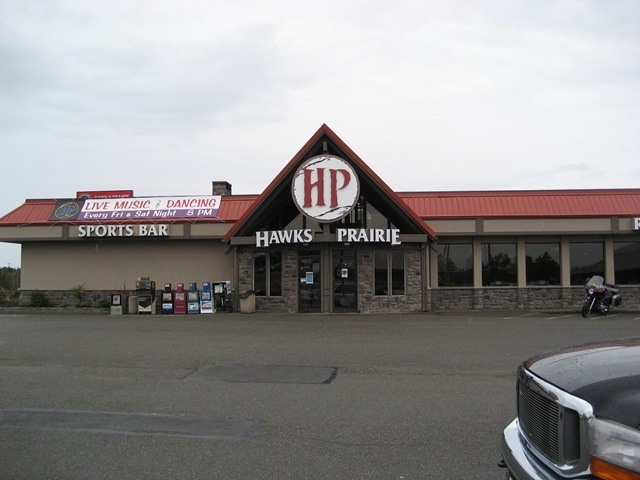 Hawks Prairie had "Texas-style air conditioning" (the kind that "makes your teeth hurt," as Tom Wolfe wrote in The Right Stuff), so it was a bit uncomfortable. 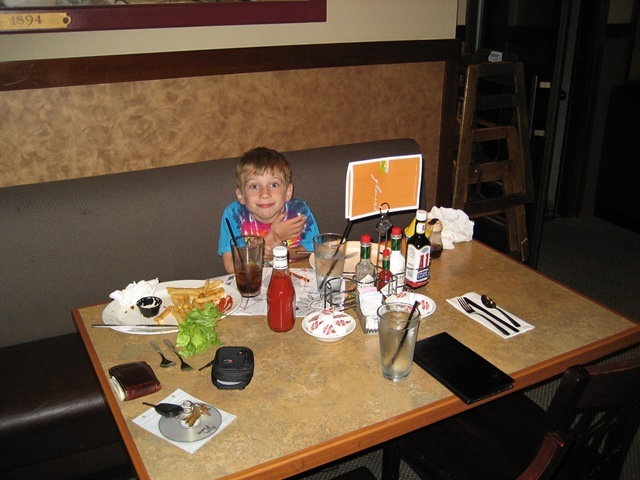 The menu was typical American lunch faire, but Cameron was able to order a pancake. My friends Monica, Steve, and Ray, who were also driving to the concert, joined us at the restaurant to use the restroom and then to chat. They left around the time we got our food. When Erik and Ken finished their lunch, they went to the casino while Cameron and I finished our lunch and paid the bill. When I left the restaurant, it started to sprinkle -- and I was hoping the weather wouldn't be a repeat of Friday night's torrential rain. Erik and Ken soon returned to the car with their winnings, and we drove off. After another hour and a half, we arrived in Ridgefield, and were directed to park in a grass field. I hoped we would park closer to the venue than we did the night before -- but we ended up about a mile away. I also noticed the air was incredibly humid, at least for the Northwest. We walked inside the venue and found our seats. Since we had some time, I took Cameron to the front of the stage and showed him Geddy's keyboards, the lighting rigs, and all the people working on the stage. He was a little overwhelmed to be that close. 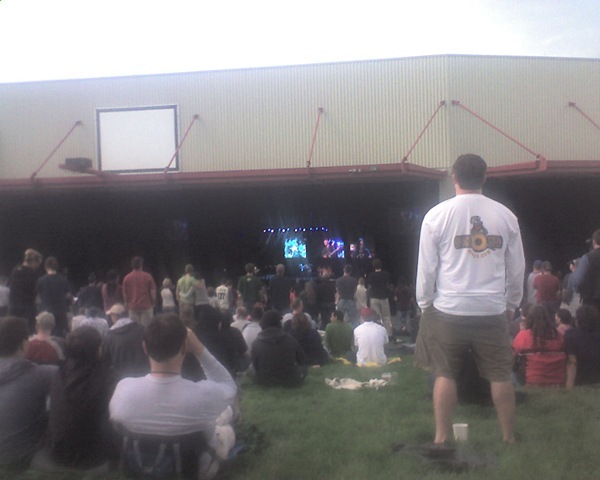 As soon as the show started, we discovered that my brother Erik -- who is six-feet-seven -- was standing in front of the shortest people in the amphitheater. I'd put Cameron between us for that very reason -- so people would have a nice opening between two guys over six-feet. Erik felt self-conscious and tried to lean over to help people see -- but there wasn't much he could do. The flat angle of the amphitheater floor didn't help. 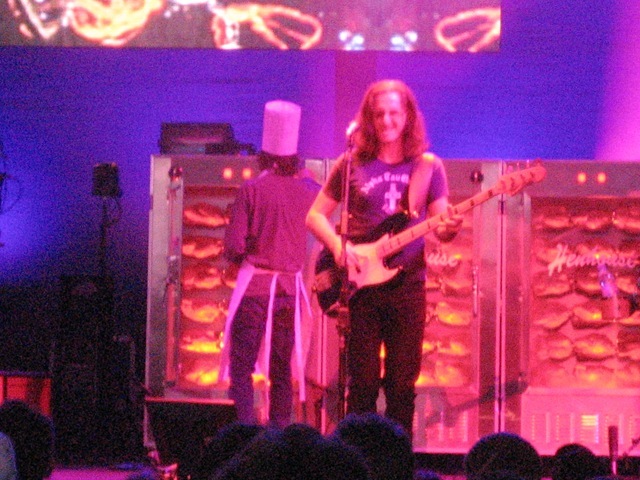 During the show, the first person to walk out and baste Geddy's chickens in the rotisserie was John Wesley of Porcupine Tree. I know he's a friend of Neil's, and I'd recently seen him in Seattle with Porcupine Tree. He even basted the little chicken hanging on Neil's hardware, as if to say hello to his friend. Then he went and sat on the side of the stage and watched the rest of the show. About halfway through the set, Cameron seemed a little tired and overwhelmed. 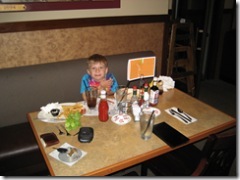 It was also much louder where we were sitting, and that's a lot for a seven-year-old to take. I asked him if he wanted to go to the lawn, and he said, "Do you?" Translation: "Yes, I want to but I'm afraid to say so." This is where you understand the meaning of being a parent: You have 15th row Rush tickets, your favorite band, and your kid wants to move to the back. Sitting on the lawn was a totally different experience. People were lying around on blankets, sitting in chairs, and there was a a more casual air. If someone stood in front of people who were sitting down, they immediately received a, "Sit down!" I sat down and let Cameron lean against me. 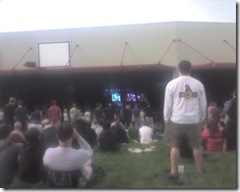 I noticed that the video monitors that were delayed from row 15 were synched perfectly from the lawn. (I'm guessing that this was on purpose.) The light show also looked different. During "Between the Wheels," I noticed that the lights were animated, moving patterns, which I couldn't see down below. After the first set was over, we returned to our seats. The band played with as much fire as the night before, but the crowd was definitely more responsive -- at least from where I was sitting. And once darkness settled around the amphitheater, the intensity of the concert increased. There's something about your sense of sight being reduced to just the band on stage, rather than seeing the entire amphitheater. It always seems louder, too. At one point, the camera police came by and told my brother, "Put it away, or I'll take it away!" The camera police seemed much more interested in catching every single person trying to take photos at this show. This brings up an interesting discussion: should bands really be worried about people taking photos of them? I can understand that they might not want flashes in their eyes, and that they definitely don't want people selling pictures of them -- but it just seems like part of modern concerts. 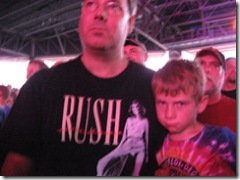 Here's my two cents: Let people take pictures and then upload them to the Rush.com website. You could document your entire tour for free! (I believe the term is called crowdsourcing but for these purposes it could be called fansourcing) And you could add fresh content to your website every day. But I digress. A lot of fans were waving signs at the band from the first 15 or 20 rows. One of them said, "Neil Peart: This is your life." I'm not sure what they were trying to communicate to Neil. There was a father and daughter who held up a sign I couldn't read. During the encore, Michael (Neil's riding partner) came over to our row and shone his flashlight. I thought, "Uh-oh, he's coming to tell us to erase our pictures!" But he stepped by us (stopping briefly to gawk at Cameron snoring away) and then handed the girl a pair of Snakes & Arrows drumsticks. The father was elated, shaking Michael's hand. I'd read in Neil's books about how he sometimes tells Michael to do this, but I'd never seen this practice in action. Here's a picture of the happy 11-year-old drummer at Rushisaband.com. 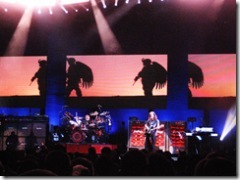 The band launched into "YYZ," and then when it was all over, Geddy gave us one of his, "You guys have been awesome!" I'd heard this the night before, too, and I knew it used to be rare for him to say this (I'd only heard it one other time). 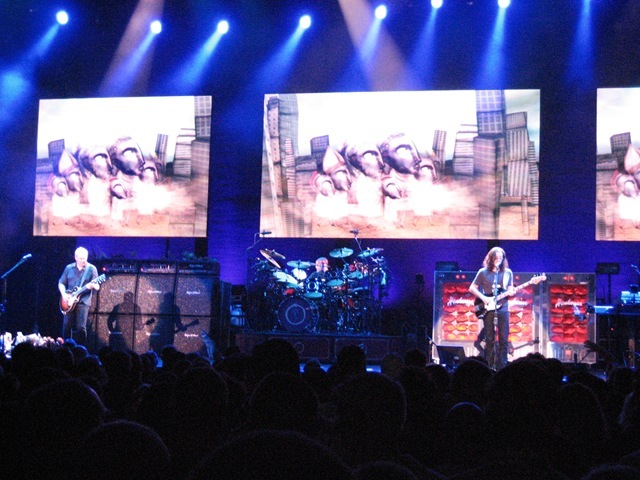 But I'd just watched two of the best Rush concerts I'd ever seen. Perhaps more shows are becoming "magical" on this tour, and Geddy is just commenting on that. Either way, I'm glad I saw both these shows. Click here for a slideshow of Clark County photos.